Cost: Starters range from £5 to £8, mains from £9 to £26, and sides from £3 to £5. Wines range from £24 to £89. About: The latest venture from Marcus Wareing, Tredwell’s, over the road from Stringfellows and Dishoom on Upper St Martin’s Lane, has an uncomplicated yet tempting menu with a strong focus on British produce and a few options for snacks, starters, mains and sides. Over 3 floors, the main dining area is upstairs, where there are long distressed leather banquets, equally distressed mirrors reaching all the way up to the high ceilings, and matt black wooden tables. Possibly the most casual and relaxed of Wareing’s eateries, the music and chatter were quite lively on the evening we were there. What We Ate: With our aperitifs, we chose a couple of snacks - the chorizo jam with charred bread (£4) was a favourite – reminiscent of Calabrian nduja, this was sweet, spicy and smoky. The courgette fritters with pine nut butter (£5) were also good, but I was half-expecting them to be courgette fries (despite fritters being clearly displayed on the menu). For starters, we had the prawns with white polenta, roast garlic and chicken broth (£8.50). I loved the clean yet intense flavours in this dish - the prawns were lightly poached and were very tender and sweet, combining really well with the soft white polenta – a great combination of flavours and textures. Our second starter, although completely different in concept, was equally delicious - braised lamb belly with aubergine and tomato curry (£6) was soft, unctuous and well flavoured, although the aubergine and tomato tasted more like an Italian caponata than a curry. For our main course, we opted for the smoked, braised beef short rib to share (£29). This was a truly sensational dish - the beef being meltingly tender, succulent, and richly flavoured with a light smoky finish. To accompany, we had a portion of chargrilled tenderstem broccoli with almond butter and anchovies (£5) which had a nice crunch. We also had a portion of polenta fries, with smoked tomato dip (£4) – they were nicely crispy on the outside and creamy inside. 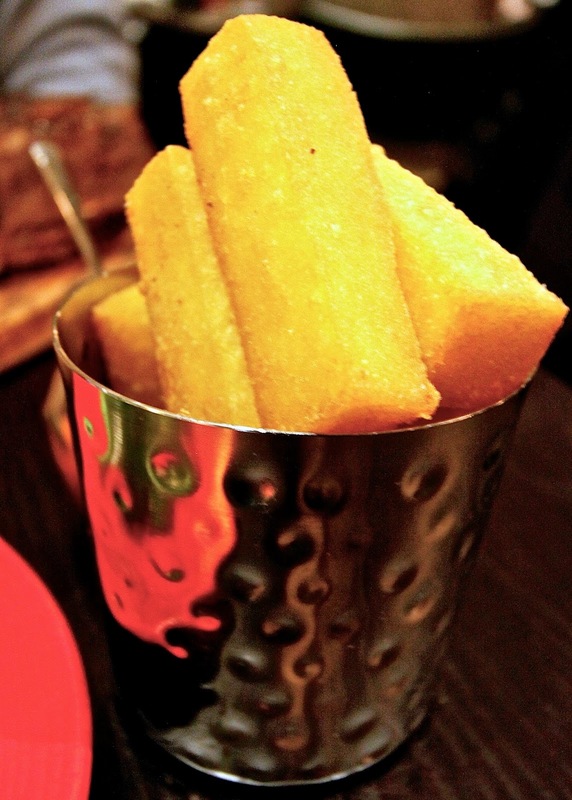 I was pleased to see polenta chips on the menu, this is a favourite of mine but hardly found in British restaurants. For dessert, we had the Pain Perdu (£6) – I have seen Pain Perdu in a few London restaurants recently which is a good thing – literally translated as “lost bread”, the name refers to reclaiming stale bread by soaking them in a mixture of egg custard, sometimes flavoured with cinnamon which are then fried in butter. Once fried, pain perdu is generally served with jam or syrup, but I enjoyed Wareing’s accompaniment of maple cream and crispy bacon – both sweet and savoury, this was a well thought out combination in my opinion. In the Basque country, they have a similar dessert called Torrijas. We also had the salted caramel soft serve (£5) – this was also good although I felt it was a tad too salty for my taste. It had crunchy honeycomb in the mix to provide a contrast of textures. 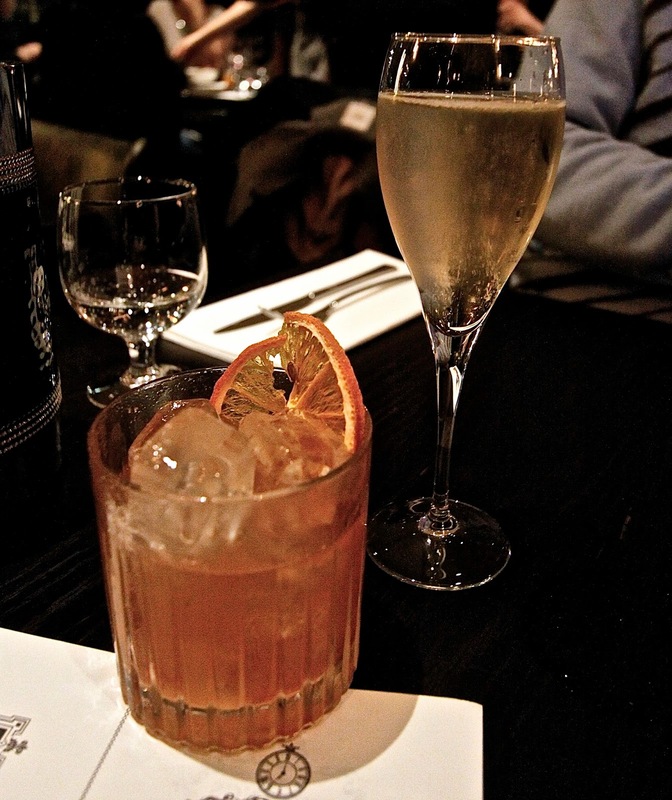 What We Drank: We started with an apertif - the New Fashioned cocktail (£9) combined rye whisky, marmalade and bitters, and a slice of freeze dried orange – this was very well made and strong as I was hoping it would be. We also had a glass of Nyetimber Classic Cuvee 2009, West Sussex (£12). This vintage English sparkly was superb, with an elegant structure, apple flavours and very fine bubbles. 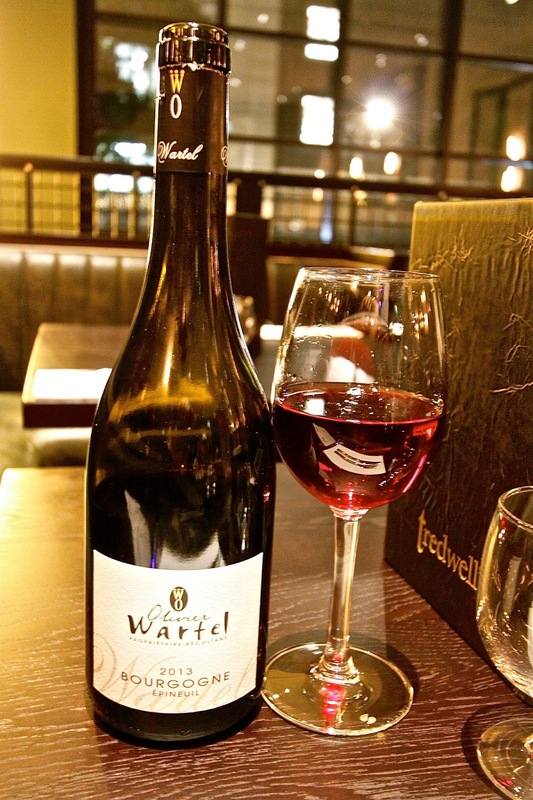 For the meal, we shared a bottle of Pinot Noir from Olivier Wartel, Bourgogne Epineuil 2013 (£61). A young wine, light in colour and weight, this still carried plenty of raspberry fruit flavours, and just a hint of black pepper on the finish. Likes: The menu is short, well thought-out and sensibly priced. Our waiter (Davide) was friendly, professional and well informed, a real joy to find good service in London. Dislikes: The venue looks uninviting from the street. Once inside, the loud music is a tad intrusive. The restaurant feels somehow cold to me and more like a bar that serves food than a proper restaurant. Verdict: Our food at Tredwell’s was beautifully executed and very reasonably priced. 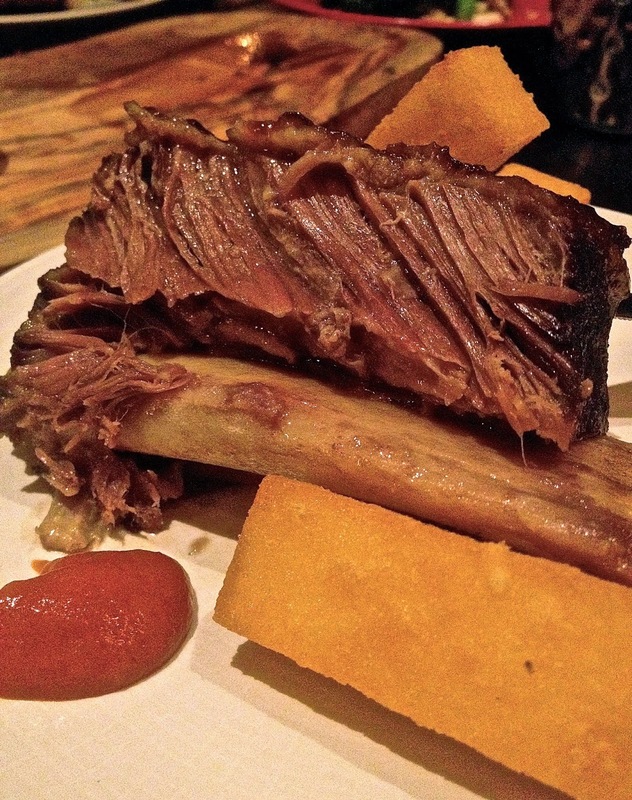 The slow-braised beef short ribs and the polenta fries were sensational and warrant a visit on their own right. Recommended. Great review, I am attempting the smoked short rib recipe from Marcus' new book this weekend. Fingers crossed!